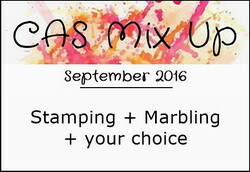 CAS Mix Up's September challenge is Marbling, so why don't you give it a try. Click HERE to see the challenge, which includes a few different marbling technique videos. This marbled piece is from my stash when I added very little colour and lots of foam, so the colours are much lighter. To finish, I was inspired to try another new technique that I saw done by my good friend Susan (Cardmaker's Garret). She die-cut acetate and then squirted drops of alcohol ink over it. The colour is so translucent and pretty. Click HERE to see Susan's card. I did more of a "smoosh" with the inks and acetate, so there's variations depending on the look you want. Super happy with this pretty fern leaf. Just popped up my marbled panel and added a very simple sentiment to finish the card. Love that soft marbling. So pretty Loll. Wow and thanks for Susan's link! I just love the rich colors of alcohol ink on acetate and the softer, matching shades marbled in the background. This is gorgeous, Loll! Loll this is beautiful - love your colours, especially on the acetate sprig of leaves. A wonderful creation. This technique gives a wonderful background, but such a delicate marbling is just amazing. I guess it is not easy to obtain such a result? I admire your skill and great imagination. Gosh, this is so pretty! Thanks for sharing! 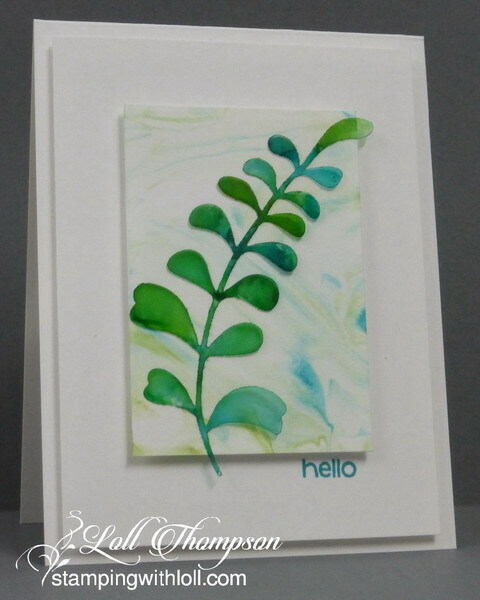 I love the contrast of the vibrant color in the fern against the soft, marbled background! Such a pretty card, my friend! Loll, I am so glad you are feeling well enough to be stamping and playing with foam! *wink This card is so pretty, simple yet so very effective and the foam technique just adds to the dimension of all your pieces!! Wonderful card and happy to see you and hope you have a great week! A gorgeous card, great background with the foam too. Gorgeous as always Loll! Love the vibrant acetate against the lighter marbling. Beautiful, Loll! Loving the pretty colors! Love that very subtle marbling, and the variation on the AI / acetate technique I used - thanks for giving me the credit and linking to my blog! Wow Loll, this is so pretty. A lovely soft and gentle background and the leaves are beautiful. You'll see that I didn't have any alcohol inks so I used Pro markers and they sore of 'pooled' and worked pretty good. So pretty and soft. Took a look at the brown/blue one and like it even better. I have a slew of marbled pieces of CS. Why haven't I played yet?? ?